Dan Conner’s popular, independent comic, “My Gal, the Zombie,” is unique in an industry saturated with tales of the undead. As acclaimed comic creator, Batton Lash (Supernatural Law) has said, “Dan Conner’s Chelsea is not your usual zombie . . . she’s more into shopping than chomping!” Batton’s description is dead right! Chelsea Checkers, previously featured in Conner’s Heaven Forbid comics series, was turned into a radioactive zombie. But, she doesn’t let that ruin her life… or, rather her after life! For Conner, this malady represents any struggle which humans go through that not only affects them personally, but also leads to negative treatment by others. In the first MGTZ story, Chelsea is told she cannot enter a restaurant where her mortal boyfriend takes her for a date. While this is due to her being a zombie, her zombism represents anything which leads to rejection. Not taking “no,” for an answer, she finds a sneaky way to dine with her guy, until chaos and hilarity ensue. This scene specifically displays the influence of classic sitcoms such as I Love Lucy and Bewitched. “Through watching I Love Lucy with my daughter,” says Conner, “I found how foundational it had been on my approach to comedy. I had probably seen most of the series with my mother before even starting Kindergarten.” The concept of a supernatural lady being in a relationship with a mortal is also found in Bewitched, especially as Conner has described the series “like Bewitched, except with a zombie instead of a witch,” in his Kickstarter video at www.MyGalTheZombie.com. After selling out of repeated prints of DIY mini comics and smaller print runs, Conner has decided to take his series to Kickstarter. The campaign ends on December 13, 2013, and is not quite 70% funded. The goal is to not only release an over 100 page graphic novel, but to also release an official soundtrack. The graphic novel, “Everyone Loves a Green Skinned Girl,” will collect all of the material form the small print run comics, Conner’s webcomic at www.CrazyGoodComics.com, and other publications such as the online Denver Westword (for which Conner’s strip was an internet winner of their comics contest), and this year’s A Very Zombie Christmas #5 from Antarctic Press. There will also be guest art from Dan Parent (Betty & Veronica), Batton Lash (Archie Meets the Punisher)¸ Stephanie Mided (Scout), Riki Takaoka (Maiden Voyage)¸Chad Blakely (Kidnapping Kevin Smith), Zach Bassett (Grimm Fairy Tales Hunters)¸ Jason Montoya (Abigail), Gerry Mulowayi (Constructs), and Josh Lyman (Voltron United and Drawn). In all, this book, to be released by Lamp Post, Inc., will feature creators from all throughout the industry. The soundtrack features music which pops right off the page, consisting of zombie and romance songs in a variety of genres, including punk, psychobilly, retro pop, hip hop, and even bluegrass. Featured are tracks which not only debut on this album, but those which are rare and even out of print, even digitally. Bands include Blaster the Rocket Man, Huntingtons, The Ghost Storys, The Jekylls, Soul Daddy, Destroy Nate Allen, Concombre Zombi, Sick City Daggers, The Nobody Elses, Grave Robber, The Tromatons, Cactus Jack and his Band of Outlaws, and Dead By Dawn. It will be released in print and digitally by HairBall8 Records. Having ran one successful Kickstarter already, (he raised over 150% of his goal for the My Little Bronco t-shirt and comic) Conner knew that it was a great forum to not only raise funds, including advanced royalties for the bands, but also generate interest in his zombie gal. He could not have been happier, furthermore, when he found it had been chosen as a featured staff pick for comics and his area, of Denver, CO. “I thought that it was just displaying my campaign because I was signed in to my account, until I saw that it was listed with the featured campaigns when I logged out!” he expressed. Beyond that, Conner features many unique backer rewards such as My Gal, the Zombie hot sauce, eye shadow, mirror compacts, and vintage card cases. Everyone who backs at least $20 will also receive a digital art book showcasing 50 pages of rare and unpublished art by Conner. Titled Gals and Monsters, this art book is not or sale and can only be obtained for free through backing the Kickstarter. On top of everything else, there is a special reward for readers of Bleeding Cool! When you back the My Gal, the Zombie Kickstarter campaign, at www.MyGalTheZombie.com, simply send an e-mail to Dan Conner (who is running the campaign) through Kickstarter. Mention the code word “MyBleedingCoolZombieGal” and you will receive an exclusive, high quality, full color, 5.5×8.5 My Gal, the Zombie print, made specifically for Bleeding Cool. It will be signed and included for free with your Kickstarter rewards! Drawn in a style heavily influenced by Dan DeCarlo (Josie and the Pussycats), My Gal, the Zombie is the intersection between romance, teen humor, and zombie comics. It is decidedly not a “message” comic, but readers may respond to the eternal theme of struggling to find a place in society. As Gina Desmond of Geeking 4 Everyone has correctly observed, “My Gal, the Zombie is about a girl who caught the zombie virus and is trying to live a normal life. Her friends and boyfriend are supportive of her being a zombie, which makes her life a little easier.” Hopefully, readers can enjoy the antics of a rejected undead girl, even as they supportively make their friends lives a little easier (whether they have green skin or not)! 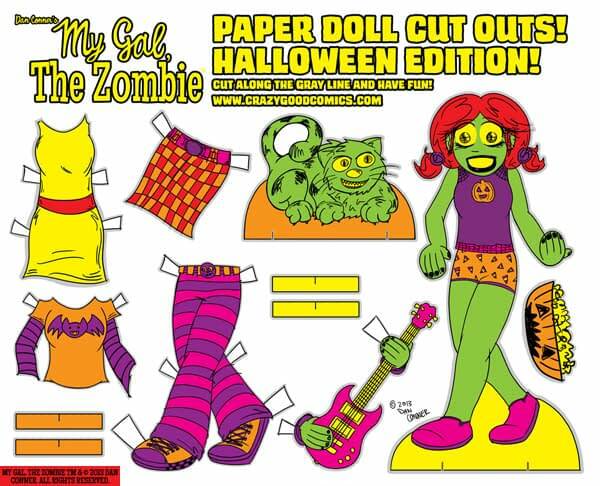 Make sure to receive the exclusive Bleeding Cool My Gal the Zombie print when you back the My Gal, the Zombie Kickstarter today! It is available at www.MyGalTheZombie.com until December 13, 2013.